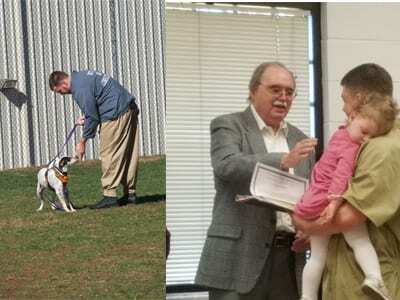 The Graduation Ceremony of Rescued was held on January 26th at the Colwell Detention Center. Rescued is a joint effort between Colwell Probation Detention Center, Mountain Shelter and Castoff Pet Rescue to rescue dogs who would otherwise be euthanized, while providing a positive impact on the offenders within the Colwell Detention Center. Each Program participant made an impact statement and it was abundantly clear the positive effect the time spent working with these dogs and the wonderful people associated with the program had made on these men. I have always thought dog was God spelled backwards because dogs are such a beautiful reflection of unconditional love. This program makes the lives better for so many more than the ones in the program, it reaches every aspect of the rest of these men’s lives, family, coworkers, friends and each person they may ever encounter. I would love to see this program all over the United States. Enjoy the photos and the full graduation video below.